The Cygnus spacecraft is a single-use American automated cargo spacecraft developed by Orbital Sciences and now built and launched by Northrop Grumman as part of NASA's Commercial Orbital Transportation Services (COTS) developmental program. It is launched by Northrop Grumman's Antares rocket or ULA's Atlas V and is designed to transport supplies to the International Space Station (ISS) following the retirement of the American Space Shuttle. Since August 2000 ISS resupply missions have been regularly flown by Russian Progress, as well as by the European Automated Transfer Vehicle, and the Japanese H-II Transfer Vehicle. With the Cygnus spacecraft and the SpaceX Dragon, NASA seeks to increase its partnerships with domestic commercial aviation and aeronautics industry. Cygnus is the Latinized Greek word for swan and a northern constellation. With Rocketplane Kistler unable to meet funding obligations for its K-1 launch vehicle under the terms of the COTS agreement, NASA decided on October 18, 2007 to terminate its contract with Rocketplane Kistler and re-award its contract after a competition. On February 19, 2008 NASA announced that it had chosen Orbital Sciences as the new winner. On December 23, 2008, NASA awarded Orbital Sciences a $1.9 billion contract under the Commercial Resupply Services (CRS) program. Under this contract, Orbital Sciences will deliver up to 20 tons of cargo to the ISS through 2016 in eight Cygnus spacecraft flights. By April 2010 Orbital had displayed a full-scale model of the Cygnus cargo delivery spacecraft at the National Space Symposium (NSS) in Colorado Springs, CO. Launched on an Antares (renamed from Taurus II) medium-class launch vehicle or Atlas V, the first Cygnus flight was originally planned to occur in December 2010. The Cygnus demonstration mission was successfully launched on September 18, 2013. On January 12, 2014, the first scheduled Cygnus resupply mission arrived at the space station; the capsule carried Christmas presents and fresh fruit for the astronauts. Its arrival was delayed, first by the need to repair the station, and then by frigid weather at the launch site and solar flares that forced postponements. With the December 2015 launch of Orb CRS-4 on Atlas V, the Enhanced version made its debut. While it was planned from the beginning to fly on the fifth mission, the Orb CRS-3 failure and subsequent move to Atlas V meant a delay. On the other hand, the lessons learned on packing and the extra capabilities of the Atlas allowed payload to be increased to 3,500 kg (7,700 lb). The Cygnus spacecraft consists of two basic components: the Pressurized Cargo Module (PCM) and the Service Module (SM). The PCM is manufactured by Thales Alenia Space in Turin (Italy). The initial PCMs have a volume of 18 m3. The service module is built by Orbital ATK and is based on their GEOStar and LEOStar spacecraft buses as well as components from the development of the Dawn spacecraft. It has a gross mass of 1,800 kg with propulsion provided by thrusters using the hypergolic propellants hydrazine and nitrogen tetroxide and is capable of producing up to 4 kW of electrical power via two gallium arsenide solar arrays. On November 12, 2009, Dutch Space announced it will provide the solar arrays for the initial Cygnus spacecraft. The fourth and all subsequent Cygnus spacecraft are planned to be of the "enhanced" variant, as the standard variant has been retired. These will use a stretched PCM which increases the interior volume to 27 m3 and the service module will use Orbital ATK Ultraflex solar arrays which will provide the same amount of power as the previous solar arrays but at a lower mass. A new upper stage built by Orbital ATK, the Castor 30XL, will be used in conjunction with the enhanced Cygnus; because of the more powerful upper stage and the lighter solar arrays, the payload that Cygnus can deliver to the ISS will be increased by 700 kg. During nominal CRS missions, Cygnus maneuvers close to the International Space Station, where the Canadarm2 robotic arm grapples the spacecraft and berths it to a Common Berthing Mechanism on the Harmony module in a similar fashion to the Japanese H-II Transfer Vehicle and the other American CRS vehicle, the SpaceX Dragon. For typical missions, Cygnus is planned to remain berthed for about 30 days. Cygnus does not provide return capability, but can be loaded with obsolete equipment and trash for destructive reentry similar to the Russian Progress vehicles. A formerly planned variant of Cygnus would have replaced the PCM with the Unpressurized Cargo Module (UCM), based on NASA's ExPRESS Logistics Carrier, and would have been used to transport unpressurized cargo, such as ISS Orbital Replacement Units. Another proposed variant would have replaced the PCM with the Return Cargo Module (RCM), which would have allowed Cygnus to return cargo to Earth. On April 10, 2014 NASA announced to potential bidders new requirements (CRS-2) for the delivery and disposal of pressurized and unpressurized cargo to and from the ISS. To meet NASA's requirements for the CRS-2 contract, Orbital ATK put together a bid that included three different variants of its Cygnus spacecraft to meet the various requirements outlined in the CRS-2 contract. Orbital was awarded a CRS-2 logistics contract on January 14, 2016. First version would be the Enhanced Cygnus upgraded to carry 10 to 15 percent more pressurized cargo than the current CRS-1 Cygnus version. Second version would be a larger Pressurized Cargo Module (PCM) that would use an Atlas V rocket. This would deliver the largest pressurized cargo volume to ISS. Third version would be an Unpressurized Cargo Module (UCM), based on NASA's ExPRESS Logistics Carrier. The unpressurized Cygnus would look different than its pressurized counterparts, with a cargo carrier taking the place of the PCM. The unpressurized Cygnus would berth to the Common Berthing Mechanism (CBM), just like the current cargo vehicles to US Operating Segment (USOS). In essence, what Orbital ATK proposed for their CRS-2 contract was an Antares-based Cygnus design and an Atlas-based Cygnus to take advantage of both vehicles lifting capabilities – placing the smaller Cygnus on Antares and the larger Cygnus with more cargo on an Atlas V.
Frank DeMauro, Vice President of Human Space Systems and Space Logistics & CRS Program Director for Orbital ATK commented, "We did that to give NASA maximum flexibility in picking and choosing the types of missions they want. List includes only currently manifested missions. Eight missions are currently planned to be launched from Mid-Atlantic Regional Spaceport Launch Pad 0A on Antares, while two are planned to be launched on Atlas V rocket from Cape Canaveral SLC-41. The PCM of each mission thus far has been named after a deceased NASA person (mostly astronauts). First Antares launch, demonstrated Antares's performance and capability to place its payload on a precise target orbit. First Cygnus mission, first mission to rendezvous with ISS, first mission to berth with ISS, second launch of Antares. The rendezvous between the new Cygnus cargo freighter and the International Space Station was delayed due to a computer data link problem, but the issue was resolved and berthing followed shortly thereafter. First Commercial Resupply Service (CRS) mission for Cygnus, first Antares launch using the Castor 30B upperstage. Second Commercial Resupply Service (CRS) mission for Cygnus. First Antares launch to use Castor 30XL upperstage, delayed due to boat in launch safe zone. Second takeoff attempt suffered a catastrophic anomaly resulting in an explosion shortly after launch. Contents of the cargo included food and care packages for the crew, parts, experiments, and the Arkyd-3 Flight Test (Non-optical) Satellite from Planetary Resources. First Enhanced Cygnus mission; Orbital Sciences contracted with United Launch Alliance to launch this Cygnus on an Atlas V rocket from Cape Canaveral Air Force Station. Second mission to fly on an Atlas V. Orbital Sciences has an option with United Launch Alliance to conduct a third Cygnus launch on an Atlas V rocket if necessary. The Antares 230 rocket carrying Cygnus lifted off at 7:45 pm EDT, October 17. Successful rendezvous was achieved on October 23 at 10:53 am EDT. November 11 launch was scrubbed with less than 2 minutes remaining in the count when an aircraft entered the hazard zone. The intruder was a general aviation aircraft approximately 6 miles (∼10 km) offshore and flying at an altitude of about 500 feet (152 meters); it was not responding to calls. ^ "The Annual Compendium of Commercial Space Transportation: 2012" (PDF). Federal Aviation Administration. February 2012. Retrieved 8 February 2013. ^ a b "Cygnus Fact Sheet" (PDF). Orbital ATK. 2015-03-24. Retrieved 2016-07-09. ^ a b c d e f "ISS Payload Opportunities on Cygnus" (PDF). Orbital Sciences Corporation. 2015. Retrieved 2016-07-09. ^ Gebhardt, Chris (2015-08-14). "Orbital ATK make progress toward Return To Flight of Antares rocket". NASASpaceflight.com. Retrieved 2015-08-14. ^ "Cygynus Beyond Low-Earth Orbit – Logistics and Habitation inCis-Lunar Space" (PDF). ^ "Thales Alenia Space — Cygnus". Thalesaleniaspace-issmodules.com. Archived from the original on 2011-07-16. Retrieved 2011-03-01. ^ a b "NASA Taps SpaceX, Orbital Sciences to Haul Cargo to Space Station". Space.com. 2008-12-23. Retrieved 2011-03-01. ^ "Time Runs out for RpK; New COTS Competition Starts Immediately". Space.com. 2007-10-19. Retrieved 2011-03-01. ^ Bergin, Chris (2008-02-19). "Orbital beat a dozen competitors to win NASA COTS contract". NASASpaceflight.com. Retrieved 2015-08-14. ^ "Orbital Unveils Full Scale Cygnus Model". Orbital. Retrieved April 1, 2010. ^ a b c "Space Act Agreement with NASA and Orbital for COTS" (PDF). NASA. 2008-02-27. Retrieved 30 March 2012. ^ "Orbital Sciences To Build Taurus II". AviationWeek.com. Retrieved 2011-03-01. ^ a b Byerly, Josh; Perrotto, Trent J. (September 2013). "NASA Partner Orbital Sciences Launches Demonstration Mission to Space Station". Press RELEASE 13-284 (Press release). NASA. Retrieved September 19, 2013. ^ "Christmas delivery finally for space station". January 12, 2014. ^ Gebhardt, Chris (2015-08-31). "Enhanced Cygnus to help Orbital ATK meet CRS contract by 2017". NASASpaceflight.com. Retrieved 2015-08-31. ^ Peter B. de Selding (2009-11-12). "Dutch Space to Build Solar Arrays for Orbital's Cygnus Cargo Tug". Space News. ^ a b "Cygnus Enhanced Spacecraft to Use Ultraflex™ Solar Arrays". Orbital Sciences. November 2011. Retrieved March 30, 2012. ^ Bergin, Chris (2012-02-22). "Space industry giants Orbital upbeat ahead of Antares debut". NasaSpaceflight (not affiliated with NASA). Retrieved 29 March 2012. ^ "Antares A-ONE Pre-flight Briefing". NASA. 16 April 2013. Retrieved 22 April 2013. Typical mission will be about 30 days, including the rendezvous, the time aboard station, the time to de-orbit. We could extend that to 60 or 90 at NASA's request, however once we separate from the space station, the spacecraft itself, depending on its fuel load could probably fly easily for another year, in terms of what the components are certified for. ^ "Cygnus Advanced Manoeuvring Spacecraft Fact Sheet" (PDF). European Space Agency. 2010-09-01. Retrieved 2 April 2012. ^ Whitesides, Loretta (2008-02-20). "Orbital Sciences Scores NASA's Commercial Orbital Transportation Services (COTS) Award Worth $170M". Wired. Retrieved 30 March 2012. ^ Gebhardt, Chris (26 April 2017). "Orbital ATK highlights advancements to Cygnus for CRS-2 contract flights". NASA Spaceflight. ^ a b Leone, Dan (2015-08-17). "NASA Orders Two More ISS Cargo Missions From Orbital ATK". SpaceNews.com. Retrieved 2015-08-17. ^ a b c d "Worldwide launch schedule". spaceflightnow.com. Archived from the original on 11 September 2013. Retrieved 9 August 2013. ^ Stephen Clark (21 April 2013). "Antares test launch paves new highway to space station". Spaceflight Now. Retrieved 4 June 2018. ^ Graham, William (2013-04-21). "Antares conducts a flawless maiden launch". NASASpaceFlight. Retrieved 2018-06-04. ^ "First flight of Cygnus cargo craft delayed to September". Spaceflight Now. 6 May 2013. Retrieved 7 August 2013. ^ a b Pearlman, Robert Z. "Orbital Sciences Names Next Private Space Station Freighter for NASA Astronaut". collectSpace.com. Retrieved 9 December 2013. ^ a b c d e f g Justin Ray (4 November 2016). "Atlas 5 rocket to launch space station cargo delivery mission in March". Spaceflight Now. Retrieved 5 November 2016. ^ Bergin, Chris (2013-09-28). "Orbital's Cygnus successfully berthed on the ISS". NASASpaceFlight. Retrieved 2013-10-08. ^ "ISS Commercial Resupply Services Mission (Orb-1)". Orbital Sciences. Retrieved 8 January 2014. ^ "Worldwide launch schedule". spaceflightnow.com. Archived from the original on 11 September 2013. Retrieved 21 December 2013. ^ a b Kramer, Miriam (2014-12-09). "Private Cargo Spacecraft Gets New Rocket Ride After Accident". Space.com. Retrieved 2015-08-12. ^ a b c d "Orbital ATK Team on Track for Fall 2015 Cygnus Mission and Antares Return to Flight in 2016". Orbital ATK. 2015-08-12. Retrieved 2015-08-12. ^ a b c "Orbital ATK Updates Progress on International Space Station Cargo Delivery Program for NASA". Orbital ATK. 2015-08-12. Retrieved 2015-08-12. ^ a b c "Orbital ATK Orders Second Atlas 5, Leaves Door Open for More". SpaceNews.com. 2015-08-12. Retrieved 2015-08-12. ^ Foust, Jeff (13 September 2016). "Antares return to flight now planned for early October". spacenews.com. Retrieved 14 September 2016. ^ NASA. "Orbital ATK Launch Updates". Retrieved 18 October 2016. 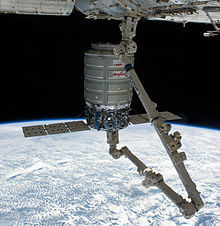 ^ "Cygnus Attached to Station's Unity Module | Space Station". blogs.nasa.gov. Retrieved 2016-10-24. ^ Ray, Justin (4 June 2017). "S.S. John Glenn freighter departs space station after successful cargo delivery". Spaceflight Now. Retrieved 6 June 2017. ^ a b "Cargo Resupply Services". Orbital Sciences. Archived from the original on 11 December 2013. Retrieved 8 December 2013. ^ Clark, Stephen (28 April 2017). "Launch Schedule". Spaceflight Now. Retrieved 28 April 2017. ^ Campbell, Lloyd (11 November 2017). "Antares OA-8 Launch Scrubbed". SpaceFlight Insider. ^ Clark, Stephen (21 May 2018). "Antares rocket launch kicks off space station's next commercial cargo delivery". Spaceflight Now. Retrieved 23 May 2018. ^ "Antares rocket rolls to Virginia launch pad, liftoff delayed to Monday". spaceflightnow.com. 2018-05-18. ^ Clark, Stephen (July 15, 2018). "Cygnus cargo ship released from space station, heads for extended mission". Spaceflight Now. Retrieved August 14, 2018. ^ a b "NG-10 Antares rocket launches successfully from NASA Wallops to ISS". Delmarva Daily Times. Retrieved 2018-11-17. ^ a b Clark, Stephen (13 December 2018). "Launch schedule". SpaceFlight Now. Retrieved 18 December 2018. ^ Clark, Stephen. "Live coverage: Countdown begins for Antares launch from Virginia – Spaceflight Now". Retrieved 2019-04-17. Wikimedia Commons has media related to Cygnus spacecraft.